Most people who use the internet should already be familiar with the word of Adam Conover who takes views on a journey of truth where each video he debunks the common misconceptions fogging the vision of the world. With a team of fact finders, Adam is on a mission to ruin everything. 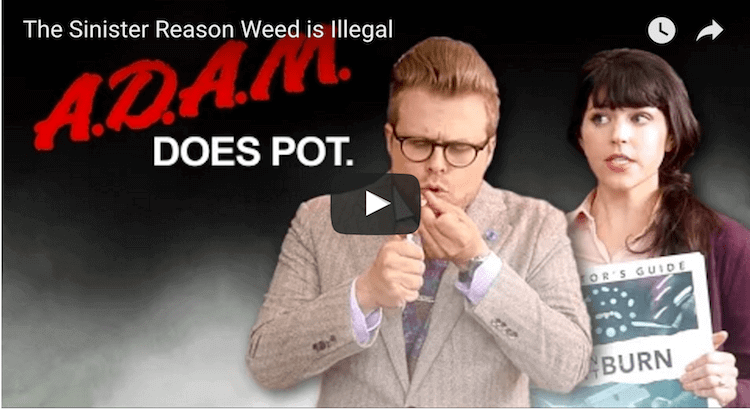 In a November episode of the popular CollegeHumor series “Adam Ruins Drugs” features a detailed explanation of the history of Cannabis or later known as Marijuana explaining why it became illegal in the first place and that it is in fact NOT a proven gateway drug or harmful when used responsibly. He also notes several facts from history which show the abuse of the justice system and manipulation of big business on the political agenda that led to such long-lasting cannabis prohibition. To the knowledgeable Cannabis enthusiast, most of the information won’t be anything new however it is good to see a platform with such a wide reach helping to expose the fallacies surrounding the war on drugs and “Marijuana” itself that often create a negative yet misguided view on this harmless plant we love so much.